Dr. Joseph Lister - a 19th Century British physician - is largely responsible for the bungalow craze, but that’s one tidbit that I’ve never seen in my books on architectural history. The fact is, Joseph Lister and his germ theory dramatically changed the way Americans thought about their homes. Because of Dr. Lister and his germ theory, the ostentatious, dust-bunny-collecting Queen Anne, with its ornate woodwork, fretwork and gingerbread fell from favor with a resounding thud. Simplicity, harmony and durability are the keynotes of the modern tendency. The general intention seems to be to avoid everything that is superfluous; everything that has a tendency to catch and hold dust or dirt. Wooden bedsteads are being replaced by iron or brass; stuffed and upholstered furniture by articles of plain wood and leather. Bric-a-brac, flounces, valances and all other superfluous articles are much less fashionable (from Household Discoveries and Mrs. Curtis’ Cook-Book). Remember the movie “It’s A Wonderful Life”? There’s a 1920s scene where George Baily and his girlfriend pause in front of the massive Second Empire house. It sits abandoned and empty, deteriorating day by day. This was not an uncommon fate for Victorian manses in post-germ theory America. Who knew what germs lay in wait within its hard-to-clean walls? 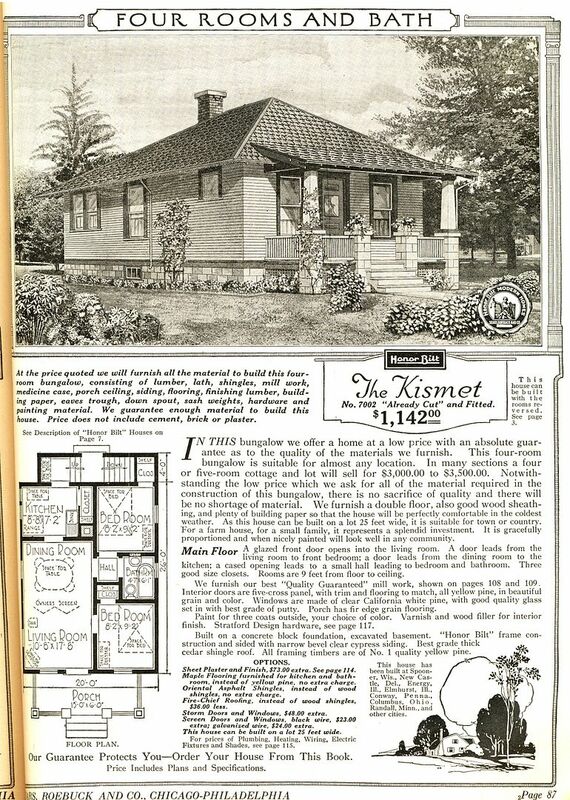 The February 1911 Ladies’ Home Journal was devoted to the new housing style: Bungalows. One headline said, “The Bungalow, because of its easy housekeeping possibilities is becoming more popular every year. And all because of Dr. Lister. 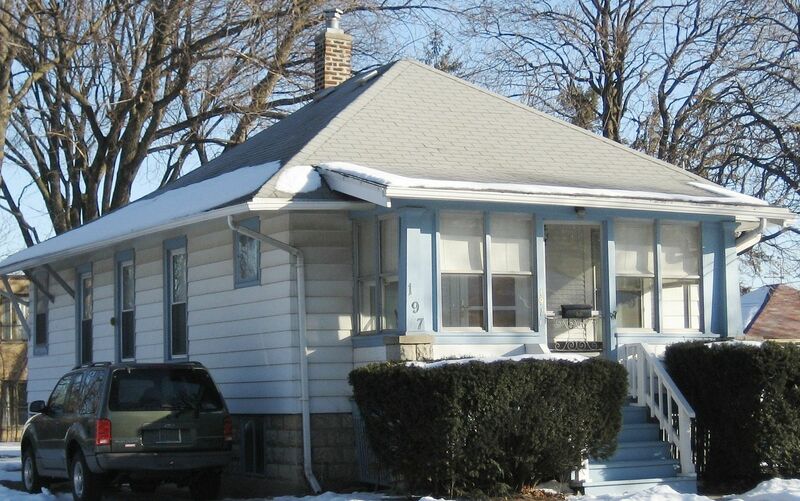 To learn more about the bungalows sold by Sears, click here. To read another fun blog, click here. The "Snow White and Sanitary Kitchen" as seen in the 1918 Sears Modern Homes catalog. Kitchens and baths were usually painted with a lead-based white enamel paint (trim and walls) because it gave the appearance of cleanliness and it was easier to keep track of dirty germs that way (and eradicate them) or so they believed. 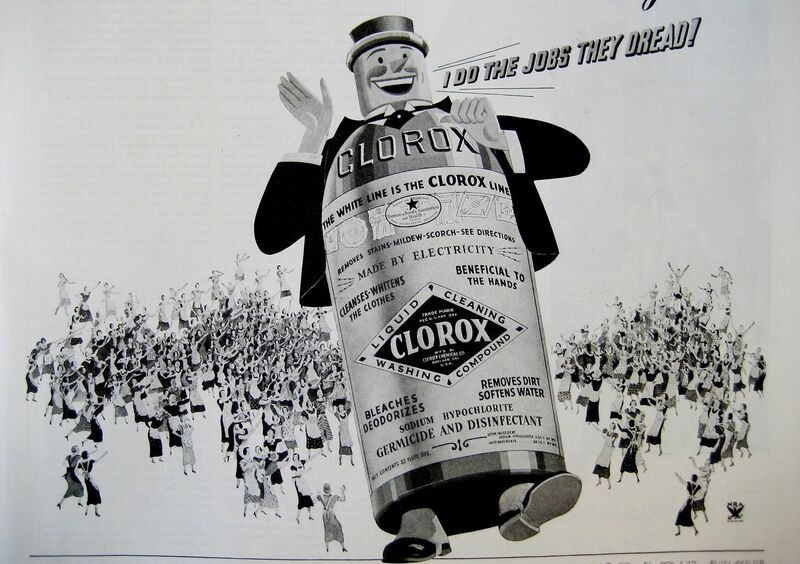 The Clorox man's claim to fame was superior germ-killing abilities. Note the adoring women praising him. Notice, they're all wearing aprons. "Germicide and disinfectant" is proudly displayed on this dapper bottle's label. The Victorian fell from favor really quickly and in its place, the diminutive bungalow became hugely popular. Look at the Kismet! It's a wee tiny house!